If there’s someone who is a certified captivating communicator, among other best speakers around the globe, it would be the co-founder of Apple, the one who revolutionized overall technology design, purpose and the industry itself — Steve Jobs. 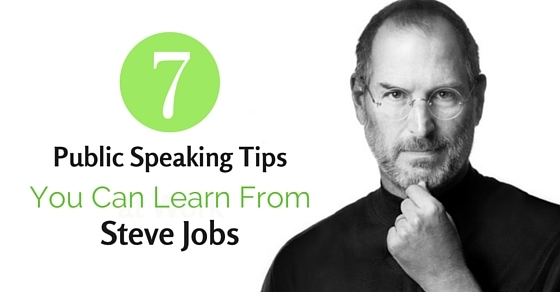 Steve Jobs not only saw the breakthrough in the technological industry but has also taken up a notch the way speakers deliver their corporate presentations. He is still probably the greatest spellbinding storyteller in the industry. A question perhaps? It could be anything that would catch your audience’s attention before you begin your slides. This tip isn’t new. It is advised that before you even begin your presentation, have an ice breaker first in order to establish a connection with your listeners. So, did it occur to you that the “3 revolutionary products” he was referring to was in fact the iPhone? Brilliant introduction, isn’t it? Let your audience wonder, have them guessing and puzzle over your skillful tricks. Your goal should be to have the audience focus on you, not on your presentation. Your presentation should only include the necessary visuals that would support your claims and make your viewers understand furthermore what you’re discussing. Don’t give away too much on your slides and just read what is already there, you’re there to elaborate on what is being shown in each slides. The problem or the villain here was the regular cellphones, how it’s not convenient and does so little for the consumers. How it is not providing ease and comfort for them. See what he did there? He presented the iPhone as somewhat the solution to a less convenient smartphone. He declared it as a smartphone that will live up to the consumer’s expectations and greater even. Your presentation may discuss a broad and complicated topic which includes complicated terms. Worry not, my friend. Don’t stress yourself too much. Instead, present your slides like how you tell stories, don’t stand like a robot dictating what is stated in the slides and only explaining a bit of it. Study your presentation and practice it. Once you’ve got your full grip on it, you’ll be able to explain it in ease as if it’s just a story you’re sharing. Furthermore, sharing stories works as well when delivering a speech. If you have a relevant story which you can connect to what you’re tackling, go on and share it. Demonstrate how it correlates. If you are to present in a class and got your topic randomly; the topic which you don’t really like, we’re not pushing you to pretend to like it. But surely as you go on researching and building your presentation, you will most certainly increase your interest in it. To put it simply, show enthusiasm and demonstrate how much you know about what you’re discussing. Create a positive atmosphere and establish connection with your audience. About Chie Suarez: Aside from providing tips and hacks in personal and career development, Chie Suarez is also a resident writer for The Fordham Company — one of Australia’s top celebrity management companies and a major celebrity speakers bureau. Next articleHow to Avoid Computer Eye Strain at Work?